Several years ago my daughter Heather and I visited a friend’s lovely flower garden. The friend commented that she hadn’t yet seen a monarch. Minutes later, one appeared. It sipped nectar from an orange and black coreopsis. My daughter and I exchanged looks. Butterflies are important symbols in our family. The day of my mother’s funeral my aunt was visiting out in her yard near the Japanese lilac she’d planted in memory of her husband. This was the first time the tree had bloomed since it had been planted five years ago. My aunt happened to glance at the tree. Dozens of swallowtails and monarchs flitted around the fragrant blooms. 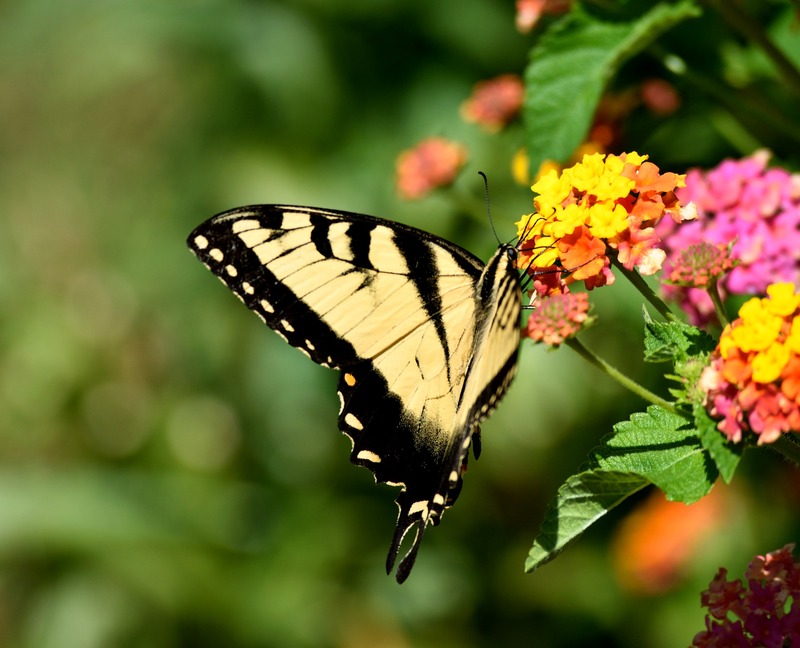 When a yellow and black swallowtail left the others and flew toward my mother’s house, my aunt felt comforting peace and joy. She concluded that my mother had reunited with those who had died before her, and now she and my father were flying off together. When Heather became engaged to her boyfriend Michael and planned an August reception at Waunakee Village Park, I wanted to include the butterfly. Thinking about how much my mother would have loved to share in her granddaughter’s special day, I talked to the family about releasing butterflies as part of the ceremony. They agreed. My husband began building two butterfly boxes. Meanwhile, I scoured the woods and prairies for caterpillars, chrysalises or adult butterflies. My husband and I erected a huge rearing tent in the backyard. I managed to nab quite a few adult butterflies and checked daily that my captives had plenty of soaked sugar-water sponges for nourishment. I even brought them a vase of flowers so they could unfurl their proboscises and sip natural nectar. Despite my efforts, the butterflies tried to escape. And many succeeded. With only a few remaining, I desperately searched online and ordered chrysalises. My timing was off and the first bunch hatched too soon. I ordered again. The second batch wouldn’t hatch in time. I constantly harassed butterflies visiting my flower garden. And I apologize to any of you, dear friends, who wondered at the woman who, net in hand, trespassed on your land. The wedding date approached. My husband painted the butterfly boxes white. I pictured filling them with orange monarchs, yellow and black swallowtails, and any other unlucky winged beauties. In my mind’s eye, my daughter and Michael, at a symbolic time in the ceremony, would lift the lid and the sky would be filled with colorful wings. They’d soar over our heads and surround us, landing on tree branches and on guests’ shoulders. On the day of the wedding, rain fell as I transported my three haggard butterflies to the park. Dressed in my elegant mother-of-the-bride dress, I realized the rain had stopped and I had a bit of time before the wedding. I used it to tromp through the damp prairie, my husband’s musky net in hand, desperately swiping at anything that flew. I managed to trap a few more victims. The sun appeared just before the start of the ceremony highlighting the prairie wildflowers in the distance and the colorful zinnias decorating the archway. As my husband walked my daughter down the aisle, my eyes filled with tears. The haunting notes of the flutist as she played Native American pipe music felt mystic in this natural setting. I held my breath. When a sandhill crane decided to join in, my daughter’s face lit up with joy. Too soon, it was time for Heather and Michael to open the butterfly houses. I held my breath. A few butterflies did manage to fly off, but the spectacle hadn’t come close to my image. Later that evening, I told my daughter how special it’d been for the crane to join in the music, then added that I was sorry the butterflies were a flop. “No.” I’d been swiping away tears then. “Followed you down the aisle,” I echoed happily. I pictured a yellow swallowtail above the zinnia archway, and from this front row seat, sharing in the celebration. Sheer perfection.